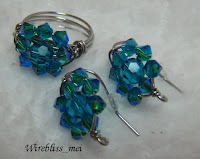 These earring and ring set is made on request. It's herringbone weave and the size of the earring is slightly over 1cm across. The middle round crystal is 6mm while those surrounding it are 4mm. Hope she likes them.